As for Q1 2015, you can add multiple pointers in a RadGauge control by using the Pointers collection. It is available for both the Linear Gauge and the Radial Gauge (Figure 1). 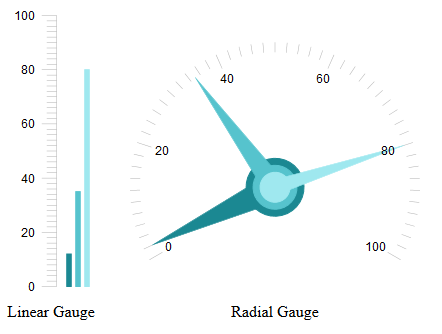 Figure 1: Multiple pointers in Linear Gauge and Radial Gauge. You can add multiple pointers in a RadGauge control by using the Pointers collection and add LinearPointeritems for a LinearGauge and RadialPointer items for a RadialGauge. Figure 1 shows two gauge controls with multiple pointers and you can examine the code that renders them in Example 1 and Example 2. Note that the Pointer inner tag used together with the Pointers collection is not a valid scenario. If it happens that both are added to one RadGauge configuration, the multiple pointers will overwrite the single one and it won’t be rendered. The style and value options available for each type of the multiple pointers are the same as the ones exposed for the single pointer.You can learn more about the available properties for Linear Gauge itemsand for the Radial Gauge. In Figure 1 are shown the two gauge controls with multiple pointers added, whereas in Example 1 you can examine the code that renders them. Example 1: Adding pointers in the Pointers collection of Linear Gauge and Radial Gauge in the markup. Example 2: Adding pointers in the Pointers collection via the code behind.